Moving from Windows 7 to Windows 10 can be a shock. Windows 7 owners missed both Windows 8 and Windows 8.1, which changed Windows significantly. If you’ve moved from Windows 7 to Windows 10 but want something more familiar, try these tricks to make Windows 10 behave more like Windows 7. When you’re through, your desktop will look much like the one in the figure below. Windows 8 introduced apps — mini-programs that hail from the world of touchscreen smartphones. In Windows 8 and 8.1, apps filled the entire screen. Windows 10, by contrast, includes a strip of apps along the Start menu’s right edge. Each app is a square or rectangular tile. To remove the app’s tiles from the Start menu, right-click any app’s tile. When the pop-up menu appears, choose Unpin from Start, and the app’s tile slides off the Start menu. Repeat with each tile until they’ve disappeared from the Start menu’s right edge, leaving only the menu behind. That doesn’t uninstall the app; it simply removes its tile from the Start menu. If you still want to access an app, click the Start button and click All Apps from the Start menu’s bottom left corner. A list of your apps and programs appears, sorted alphabetically. When you’re through, drag the Start menu’s right edge inward, clearing the empty space formerly held by the apps. If you’re still not satisfied, download and install Classic Shell (www.classicshell.net), a program that makes Windows 10’s Start menu look almost identical to the Start menu in Windows 7. 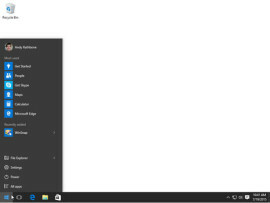 Windows 10’s digital personal assistant, Cortana, lives in the Start menu’s Search box. Some people find the little robot to be helpful: Cortana constantly dishes up a stream of news, weather reports, and even popular nearby restaurants. But if you’d prefer to keep Cortana quiet, disable the robot: Click in the Search box; when the Notebook pane appears, click the Notebook icon. Click the Settings option, and turn off the checkbox at the top of the Settings pane. Windows 7 keeps the Search box on the Start menu, ready for access with a click of the Start button. 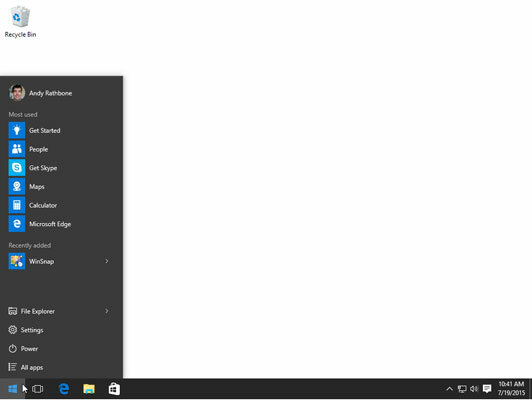 In Windows 10, by contrast, the Search box always remains on your taskbar, hogging space. When you’re ready to search, just click the Start button and start typing, as you do in Windows 7. As you start to type, the Search box appears, readily accepting your typed search term. In Windows 10, you may find that apps open your files, not your favorite programs. To switch the chores back to your programs, click the Start menu, and choose Settings. When the Settings app appears, click the System icon. Click the Default Apps section, and Windows lists which apps are currently opening your files. Click any app and a drop-down menu appears, letting you choose a different program from the list.